BeatStep is a professional app for group fitness instructors and a multifunctional music player for everyone. 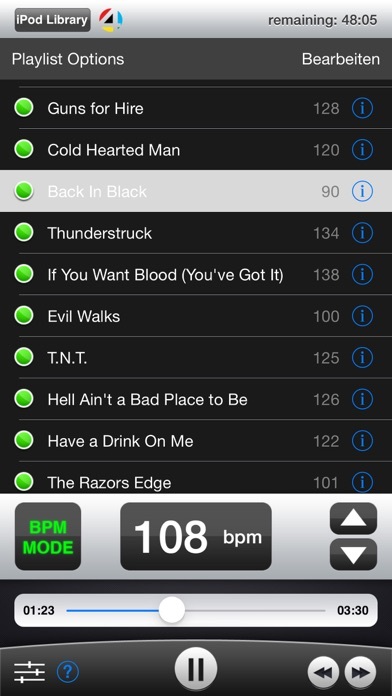 With BeatStep you can play playlists, albums and / or songs from you iPhone or iPod touch at any BPM (beats per minute) tempo, which can be changed at any time even during playback (time shifting). BeatStep is a tool primarily designed for professional fitness instructors and ambitious athletes. BeatStep is a MUST HAVE for every fitness instructor and presenter and the development was supported by renowned personalities from the fitness and aerobic scene.